Perfect for your take-out restaurant, cookout, party, gathering, or other catered event, this Visions black heavy weight plastic soup spoon will exceed your serving needs! Complete your plastic cutlery setting, or use it to fill your flatware bins at your snack shack or concession stand. Great heavy weight spoons. Extremely durable and large. Nothing worst then flimsy utensils. We found them to be a lot more affordable than the ones they sell at our local restaurant supply store! Can't believe they offer 1000 of these in "heavyweight" at this price point. I use them for catering and they serve their purpose very well. These spoons are good, I only wish they were a little stronger. They kinda tend to bend back a little bit too much. I like how the spoon shape is a circle so it makes it nice to eat soups with it. The price, quality, and the amount is fair for what you get. quality is impressive. size is perfect for soups and we also use them with regular meals. edges of the spoon are smooth unlike other cheap disposable spoons. definitely worth buying in bulk. 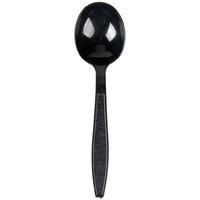 These soup spoons provide an upscale look for a black plastic spoon, its a nice break from the typical white plastic spoons, the spoons are sturdy and hold up to extremely hot soup. Our restaurant offer free soup to all our customers. We've have been use this spoon for over 10 months now. And, it perfectly fit our needs. Will keep buying it in the future. Nothing Short of amazing, we love them and use them daily as a great solution for our beans we serve our customers in both dine in and catering formats. i must have ordered 2000 of them by now and not one has ever broken!. Quality is so great people think they have to return them to us! Great, sturdy spoons. They have a deep bowl and are perfect or hearty chili and soups. No issues with broken handles, like some of the cheaper brands that we've tried. These black plastic soup spoons are nice quality. They are very sturdy and great with the hot soup we serve. They dont melt in the heat and our customers really enjoy having disposable items. Very good quality plastic spoon. These are much more durable then other comparable products that are out there. We use these for our offsite catering events. Great quality disposable plastic spoons at great price. The spoons are deep enough, so great for your hot soups. Great buy. I would order again. Thanks! Excellent quality. These spoons look and feel great. They never bend or snap, and do not feel awkward to use. They feel expensive and yet are quite affordable. Excellent choice if you want customers to feel that they have spent their money at the right place. This of black heavy weight plastic soup spoons is perfect for around the house when you have guests over for a party and you don't want to do dishes afterwards. When your ordering from a new online venue it always a little nerve racking for me. Thankful these spoons worke out great. This product is as described, 'heavy weight'. They withstand the heat from really hot soup without bending or feeling like there going to fall apart before you can finish your food. Our local store does not stock plastic soup spoons. We highly recommend using heavy weight plastic cutlery if you have to use plastic. Very inexpensive and quick shipping product. I love these soup spoons. They are pretty large! They are visions heavy weight plastic spoons in color black. They hold up well with chunky soup. These are nice soup spoons. They are of great quality. Not the kind that will break mid lunch. The product comes with many so they will last a while for anyone. The cost of plastic utensils can have a tremendous impact on a fast food stores bottom line. We save 50% by switching to Webstraunt on received the same quality product for less. Excellent soup spoon. We have never broken one in the office and they are better looking than cheap plastic spoons. I actually switched all the regular spoons over to these soup spoons. Very sturdy, durable soup spoon. These will last through any event, and they are deep so they will hold soup or other liquids without spilling over the side. Good for soup as stated, perfect shape to hold liquid while bringing it up to eat. Also good for adding honey to tea as it holds it in well until it reaches the cup. Excellent soup spoons. These are sturdy & strong & hold up great in the hot soup. Some regular customers in our building wash & reuse them because they are so strong. This was a good buy! I like the fact that I can take them camping or bring them to events or parties and not have to worry about clean up! This is a high-quality item and for a great price. I highly recommend all of the products in this line as they look and feel more expensive than they are. I especially like the ability to pick from four different color options. Perfect for soup, or anything else you would use a spoon for! These "soup spoons" have a wider and deeper bowl that allow you to scoop more food. I will never purchase standard plastic spoons again, these are way better. These spoons are great for soup because the spoon part is wide so they can hold a decent amount of soup. Love that they are strong too. All of the Visions heavy weight utensils I've bought have been fantastic. They are indeed heavy weight. You don't have to worry about them breaking from the weight of your food. Definitely recommend. With as much soup as we sell, the normal spoon just won't work. This soup spoon meets all our needs and our customers are very appreciative to have a soup spoon for take out orders. We appreciate your review, George! If you are looking for a different product that would better suit your needs, please contact our Customer Solutions team. These spoons are very strong and perfect for hardy soups. The spout is large and can hold lots of food. It also has a very pretty design. They come at a great price for the quality. Used the Visions Black Heavy Weight Plastic Soup Spoon to pick up sour cream. Leave the soup spoon the the sour cream and use it to help serve your friends family and or loved ones. We use these soup spoons for all of our catered events and weddings. The black plastic cutlery adds a elegant and practical option that we love. Good size and durability. We are very pleased with the quality of these soup spoons very sturdy and strong. They hold up great, so glad we didn't purchase cheap utensils. These spoons were deep, strong and durable. They are very well made and affordable for our new store. Absolutely perfect for soups and porridges we sell. Spoons are great for hot or cold, perfect for traveling, picnics and camping, took several to work for myself too, strong and sturdy, you can find a better price anywhere else. We are using these spoons in our catering and coffee business. They are well suited to cold salads or desserts or a piping cup of fresh roasted coffee. The right product at a good price. This is a very high quality and sturdy spoon. I have had absolutely no issues with it which is great being a cafe that serves a lot of soup. These spoons are solid. I opt to just buy the soup spoon sice it is for to-go orders. The thing I love is how they pack them tight. Same case would be 5 times the size. We can all use to save storage space and money. These acomplish both! Reliable and sturdy spoon. Hold up to the table test. Lower pricing than anywhere else. They are good for hot and cold items, hot soup is not a problem, nor is dense potato salad. We use these for our takeout chili. They look great with the paper containers with the black lids. Very nice combo. They are a great weight also. These soup spoons are solid, good quality ones. The price is right. We like the black color and are very happy with both the look and feel. The spoons are really nice ... a good weight. Its really too bad that the shipping cost is as much as the cost of the spoons - ouch! Visions Heavy Weight Black Plastic Soup Spoon - 100 / Box are made of strong plastic and hold up while eating and with stand heat.